Lazarus Gray returns to life! At the end of Barry Reese’s crossover novel, Götterdämmerung, Lazarus Gray is killed fighting Darhoth, the Mother of Pus. Now his wife Kelly Emerson Gray refuses to believe that there is no way to revive him. After all, Assistance Unlimited has seen far too many impossible things before breakfast. Friends and foes have seemingly perished, only to show up later on; somehow revived and refreshed. The first story in Volume Six, “The Affair of the Familiar Corpse,” has Assistance Unlimited with a case to solve minus their intrepid leader. But there is Bob Benton, the man known as The Black Terror. While he is not Lazarus Gray, his super-strength and nigh invulnerability makes the Terror and his sidekick Tim a force to be reckoned with! The Librarian and his red robed underlings must learn that Lazarus Gray’s little band of adventurers are still on the job. In the next adventure, “The Strands of Fate,” Lazarus Gray’s body is missing from the gigantic freezer in the basement at 6196 Roberson Avenue. It looks as though he walked out—by what means no one is sure. Meanwhile, the crew must go on. New enemies appear, and old friends return. Mr. Death, The Flame, and the Ten Fingers show up as enemies. The Heap and Nakam are new allies, while Eidolon and Abigail Cross return to aid their friends. 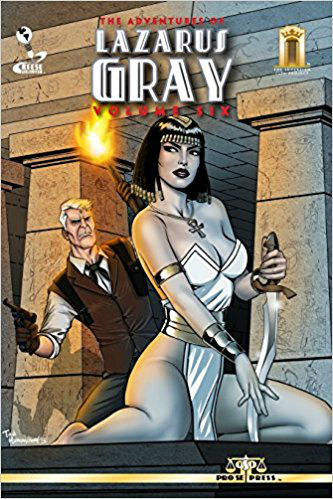 A man looking like Lazarus Gray has been spotted in Transylvania… Makes pulp fans mouths water, I assure you! Barry Reese has proven himself time and time again as an absolute master of the pulp genre. The four stories that make up this novel are Reese at his best, a spicy story served up cooked to perfection. I don’t know if I should call it raw, because it is raw pulp—or best served cold, as Lazarus Gray’s brand of vengeance is dealt out in full measure. But I know what I like, and this is superb!